made by lori: abraham lincoln was a what?! abraham lincoln was a what?! 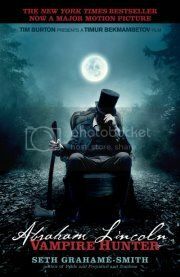 This week I finally finished Abraham Lincoln: Vampire Hunter by Seth Grahame-Smith. "Indiana, 1818. Moonlight falls through the dense woods that surround a one-room cabin, where a nine-year-old Abraham Lincoln kneels at his suffering mother's bedside. She's been stricken with something the old-timers call "Milk Sickness." Using the journal as his guide and writing in the grand biographical style of Doris Kearns Goodwin and David McCullough, Seth has reconstructed the true life story of our greatest president for the first time-all while revealing the hidden history behind the Civil War and uncovering the role vampires played in the birth, growth, and near-death of our nation." After seeing the trailer for the film (which comes out June 22), I had this on my must read list. I got on the waiting list through my library and it became available about a month later. I had high expectations for the book from the trailer. I know I shouldn't since books and movies are not usually one in the same. I also was under the impression (as is the case with most book/movie transformations) that the book would be better than the movie. This is one time I hope I'm wrong and hope the movie is better than the book. That's not to say the book was horrible. I definitely thought it was a good read and recommend it to others. It is the story of Lincoln's life as told by the author after reading through Lincoln's personal journals and letters from his birth to his death. The voice switches between the two throughout the book. There are also a number of photographs peppered throughout to give the vampire twist more authenticity. I thought the book had a good start. I was intrigued enough to keep reading. The middle which is the main vampire hunting meat of the book was a little slow for me and lacked action. I can definitely see how they will beef this up for the movie. The ending section where he became president and (unnecessary spoiler alert!) then later died was a bit rushed for me, as if the editors told him to wrap it up and end the book already. I would have liked to see less of his younger years and more of the latter. I definitely recommend it, especially if you are a fan of Lincoln, vampire stories, and/or historical type novels (yes I know it isn't real, but the author definitely makes you feel like it is). I'm linking up with Heather and Katie for Book Club Friday. Anyone else read this book? What did you think of it? also, you have a great name! You'll have to let me know what you think of the movie! Very excited for the movie!